Abstract: Stigand occupied a place in or near power for at least fifty years and yet has only been studied very peripherally and in reference to others. He has been vilified or lauded by historians ever since the Conquest. His wealth and methods of acquisition of wealth as well as his political activity have been used to paint him as an ambitious prelate interested only in power and motivated by greed. 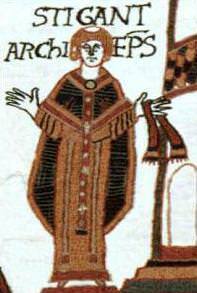 His unusual advancement to the see of Canterbury and apparent disregard for papal strictures caused him to be used as representative of all of the faults of the Anglo-Saxon Church. Other commentators took the opposite approach and portrayed him as a hero and patriot who resisted the Conqueror until he could no longer put off defeat. Neither of these interpretations is likely to be accurate and neither is wholly supported by the surviving evidence. Much of Stigand’s early life is undocumented and must be inferred within reasonable limits. Most of the sources in which extensive comment about Stigand can be found are post-Conquest and contribute their own particular challenges to discovering the facts about a largely pre-Conquest life. Based on monastic chronicles, Domesday Book, legal documents and the writings of Mediæval historians and commentators, in order to define the context in which he lived and worked including the politics of the English church, the kingdom, the Apostolic See and his lay associates this study is an attempt to clarify the life and career of Stigand, the last and extremely controversial Anglo-Saxon Archbishop of Canterbury. Only the bare bones of Stigand’s life and career are known or can be inferred with any certainty. He was born no later than 990 and probably nearer 985. As he, his brother Æthelmær and their sister held land in and around Norwich his family was probably based in Norfolk. Due to the amounts of land they held, Stigand’s family was likely a prominent though not a titled one. He may have been ordained to the priesthood at some time prior to his entry into King Cnut’s household, which could have occurred as early as 1017, though he may still have been only in minor orders. He was appointed to the minster at Ashingdon in 1020. Stigand was appointed to the bishopric of Elmham in 1043 and consecrated on the same day Edward was crowned king. Within the year Stigand was deposed and deprived of all of his possessions in conjunction with Queen Emma’s fall from grace but was restored to his office in 1044. His wealth in later life suggests that his possessions were restored to him at the same time as was his office or nearly so.